Sneaky here to share a video from ABC News about a new cat cafe on Long Island. Since my author lives there and is actually visting this pawsome place on Saturday, I thought I’d check it out. If you’re in the New York/Long Island area, you might want to, also. Cat Cafe’s are purrfect. Read the story written by Kristin Thorne about behind this great place and watch the video below it. Long Island is now home to every cat lovers’ dream – a cat cafe. Ryan Shea, of Yaphank, is the owner of Shabby Tabby Cat Cafe in Sayville. When her cat died, she became involved in cat rescue and visited some cat cafes in Colorado and New York City. This inspired Shea to open a cat cafe. The cafe features various lounge chairs, bean bag chairs and cushion benches. The space is dotted with cat ladders and cat toys. Around 15 to 20 cats are free to roam about the entire space, and all the cats come from The Golden Paw Society in Huntington and can be adopted. Shea said her other goal is to provide the community with a place of relaxation. One hour sessions cost $15, while a monthly membership can be purchased for $100. It includes 10 sessions every month, and reservations are recommended. Shea said she is planning various events, including yoga, wine night and Halloween scary movie night with cats. The cafe officially opens Saturday. Sneaky here with another pawsome interview of a pet character. Today, it’s my pleasure to be speaking with a cozy mystery cat whose current book is on tour with Escape with Dollycas Into a Good Book. Welcome, Kitty, please tell us your name and your author’s name. 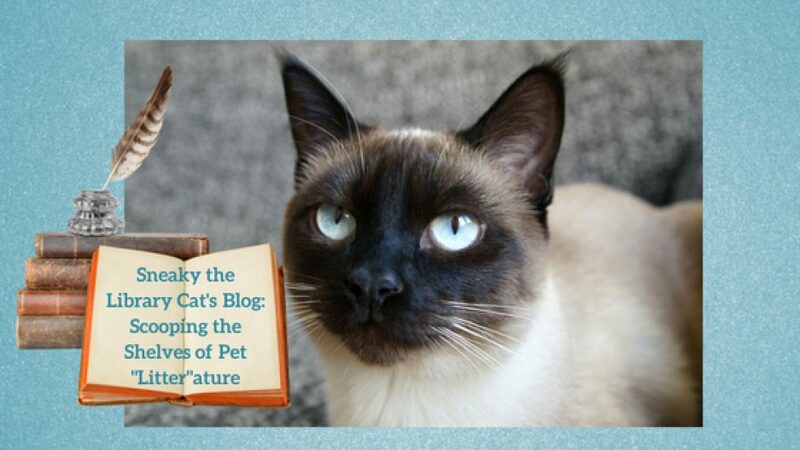 I’m Troubadour, a refined hairless cat, and I’ve given author Dorothy St. James the privilege of writing about me. I’m the star of the Southern Chocolate Shop Mysteries. Did you say “chocolate?” Mmmm. I think your books will appeal to all those chocoholics out there. As far as being a refined cat, that’s a bit redundant. All cats are refined. It’s very mice to meet you, Troubadour. Love your name, too. I’ve played a starring role in Asking for Truffle, Playing with Bonbon Fire, and In Cold Chocolate. They are all cozy mysteries. I’m a cozy mystery cat, too. Your books sound quite yummy. Seriously? Did you think one book about me would be enough? I’m in the Southern Chocolate Shop Mystery series. I allow Penn, the sleuth/chocolatier in the book, to live in the apartment above the chocolate shop with me and my friend Bertie Bays. The lives of the humans that live in the apartment are oddly droll. In the Southern Chocolate Shop Mysteries, Charity Penn, owner of The Chocolate Box, a gourmet chocolate shop in the heart of the quirky Camellia Beach community, has found a secret ingredient: A rare chocolate bean with a flavor unmatched anywhere in the world. But whenever she cooks up her treats, disaster and murder follow. Although Dorothy St. James has been owned by several cats in her life, she’s never had the honor of living with a hairless cat. Her loss, I say. My author has had many cats but never a hairless one either. Cats are purrfect no matter what breed they are. Here’s a scene from IN COLD CHOCOLATE, where I point out an important clue. But do the humans pay attention? No. Of course not. I never did get to hear what was going to come next. I liked to think he was about to swear that he’d never met a civilian sleuth with such sharp instincts. But at that very moment, Troubadour, Bertie’s hairless cat, let out an ear-piercing yeow as he charged out of Bertie’s bedroom. He looked like a blur as he darted across the room and made a beeline straight for the detective who was still standing at the open door. A shadow appeared on the floorboards of the porch beyond the door. I half-expected to see either Harley or Gavin to walk by on his way to their apartment or to pause to say hello. Having one of them pass by would also explain Troubadour’s sudden burst of energy. I didn’t have a chance to look outside. As soon as Troubadour appeared, Stella jumped up, breaking her stay command. Barking as if the world had just caught fire, she ran at the kitty, stopping only because she’d reached the end of her leash. No amount of treats was going to deter her from what she saw as her duty to keep her nemesis (the cat) from getting close to (well) anyone. She tugged and jumped and made a noisy menace of herself. Troubadour, unimpressed by this display, growled low in his throat. He swatted Stella on the nose before continuing on his path toward the door. This only made Stella even angrier. With a growly bark, she chased after the platinum-colored kitty. My attempts to rein in her bad behavior had absolutely no effect. I ended up doing exactly what Lidia had warned me not to do. I scooped Stella into my arms. My frustrated pup chomped down on my wrist as I carried her into my bedroom. I gently set her down, pried her mouth from my wrist, and provided her with a handful of treats before closing the bedroom door. “Sorry about that,” I said when I returned. Troubadour was rubbing himself against the detective’s leg and purring loudly. “I see you’re a cat person.” I peeked out the door. The mysterious shadow was gone. “Actually, I prefer dogs.” Gibbons grimaced down at Troubadour, but didn’t do anything to stop the kitty from rubbing all over his pants. I was sure I’d seen the shadow of person approaching the open door. “Did you see anyone walk by?” I asked him. “No, there isn’t. But I’m sure I saw someone.” Had someone been lurking outside the door listening? Was someone still out there waiting for me to be alone? I hugged myself and shivered. Pawsome, Troubadour. You’re quite the actor. I like that I don’t have to do much. I mean, there’s that annoying dog of Penn’s that I have to train. And I find I need to keep some unpleasant people who visit Penn in line. But other than that, I’m allowed to live like a king. I sip my milk (and occasionally some coffee) and lounge around. It’s a good life. Yes, we pet characters do enjoy a nice standard of living but, then, so do real life pets. The ones with nice humans, of claws. I’m much too important to “talk” with the humans. Besides, I’d rather give them the chance to figure things out on their own. How else will they learn? Don’t let your author turn you into “comic relief.” That kind of treatment is humiliating for you and for cats everywhere. Have some self-respect. Stand up for yourself. You’re a cat and that means something. Act like it. My author’s most recent book featuring me as the star is IN COLD CHOCOLATE (September 2018). The stupid dog gets to have her picture on all the covers of the books in the series. It’s sooo unfair. Wonderful excerpt. I feel your pain about covers. I didn’t get on one until the 3rd of our series, but I’ve been lucky that Fido hasn’t gotten featured on one yet. Sea turtles, chocolate turtles, and a shot in the dark turn life on the small town of Camellia Beach upside down. Thanks so much for the interview, Toubadour, and best whiskers to you and Dorothy on your new release and future books. I know you also have a blog tour right now, so I’m including the link to your author’s rafflecopter: http://www.rafflecopter.com/rafl/display/02887792760/? Debbie saw this video recently and asked me to post it for my Feature Friday Film. I have to admit that I had my doubts. Although these pranks that humans played on their cats seemed interesting, we felines know that we may seem to fall for these tricks but never forget them and find even more interesting ways to exact revenge. So watch this film but don’t think trying these on your own cats would be funny. By the way, the cat with the pink flower looks very much like Debbie’s cat Stripey who can be so sweet but is a master of revenge. Sneaky here with a special video my author viewed recently and asked me to post. I think you’ll agree that it’s a furry happy tearjerker. Meow there. It’s Sneaky with my first return guest. I interviewed this cat awhile back, but he asked for an update, so I kindly obliged. Hello there, Kitty, please introduce yourself and your author. My person is Elaine Faber. You can call me Thumper, or Black Cat, which is the name I’m most used to. Whichever you decide, be sure to call me to dinner. MOL (Meow Out Loud). I’ll call you Black Cat. I always call my guests by the names they prefer. My three published novels are Black Cat’s Legacy, Black Cat and the Lethal Lawyer, and Black Cat and the Accidental Angel. My person has written a fourth Black Cat novel (WIP) to be published in 2020. All are cozy cat mysteries where I am a major POV character. That means I narrate much of the story. Cats are much better writers than most humans. Cool! I agree with you. Unfortunately, my author does all the narration of our books. Maybe I can purrsuade her to change that one day. Tell us more about your series. Yes. As noted above. I’ve had three amazing adventures regarding solving a cold case murder, a Texas horse ranch, embezzlement and various other skullduggery, and emus, a vineyard and the possible appearance of an angel. If I told you more, I’d have to kill you…. You have quite the sense of humor, Black Cat. My person based my physical appearance on her cat, Boots, who has now crossed the Rainbow Bridge. His memory lives on in my mystery novels. Awww. My author’s Oliver also went to Rainbow Bridge. He was the Siamese I was based on. Although we had some differences, I hope he lives on through me, too. As John turned, he dropped his glove. He leaned to pick it up. A blast exploded from the trees and a bullet whistled past his head. He threw himself onto the ground. Black Cat flattened into the dirt. Holy cats and little fishes. What was that? “Stay down!” John crawled between the vines toward Cindy. “That bullet darn near hit me.” He lay on the ground for a minute. “Stay right here. Don’t get up. I’m going to see who’s shooting. Maybe it was a stray bullet.” He ran his hands over Cindy’s flyaway hair. Her eyes were wide, her cheeks pale. Black Cat hunkered beside her. That was a tad too close for comfort. Cindy clutched Black Cat to her chest as they lay in the dirt. Her heart thumped against his chest, matched by the beating of his own heart. What must John be thinking as he crept through the vineyard toward someone with a rifle aimed at his head? He had to leave his child alone in the middle of the field with only a cat to protect her. Poor John! Poor Cindy! Poor me! If the shooter would try to take out a man and his little girl, he wouldn’t think twice about killing a cat. He imagined how the lead story on tomorrow’s newspaper might read. The bodies of a man, his daughter and their heroic cat were found today in a local vineyard, shot to death by an unknown assailant. Drops of blood found on the brave cat’s feet bore witness to his courageous effort to save the lives of his master and child. Oh, good grief, Black Cat. Get a grip. This was no laughing matter. Somewhere in the trees next to the vineyard, a killer lurked with a rifle, and Black Cat was the only thing between the madman and Cindy. What a purrfect scene. Concatulations, Black Cat! You aren’t very modest, but most of us kitty characters aren’t. We also tend to get in trouble by sticking our paws in our book’s mysteries. I talk to other cats and to an occasional dog. Unless you consider “talking,” my narration of much of the story, as noted in the excerpt above. I try to communicate with my people, but humans being notoriously ignorant, even my best efforts are often in vain as I point out clues they need to solve anything. I shall endure. I sympathize with you Black Cat. I feel the same way. Human characters can be very dense in recognizing clues we point out to them. That’s where body language comes in and all the great feline sounds we’re capable of emitting. Yes. My person has written a fourth Black Cat Mystery which includes a mystery in Fern Lake and another mystery, as my book person seeks a hidden treasure in Austria. Very Mice. My author is finishing up our fourth book, as well. My author has a website. www.mindcandymysteries.com and her personal Facebook http://tinyurl.com/zm2j4n5 My person posts excerpts from her novels, short stories and articles on the website, and fun things about our books and other pleasant things on Facebook. See a list of all her novels below. Elaine Faber lives in Northern California with her husband and several feline companions. She is a member of Sisters in Crime, California Cat Writers, and Northern California Publishers and Authors. She volunteers with the American Cancer Society Discovery Shop. She enjoys speaking on author panels, sharing highlights of her novels. Her short stories have appeared in national magazines and multiple anthologies. She has published seven novels. Your author is quite talented, Black Cat. I enjoyed chatting with you about the books you’re in. Best whiskers on your series.